Wow where do I begin? Sara Cates and her staff is absolutely incredible. Aggressive, Smart and Persistent! Sara protected my rights with a sense of purpose and righteousness. 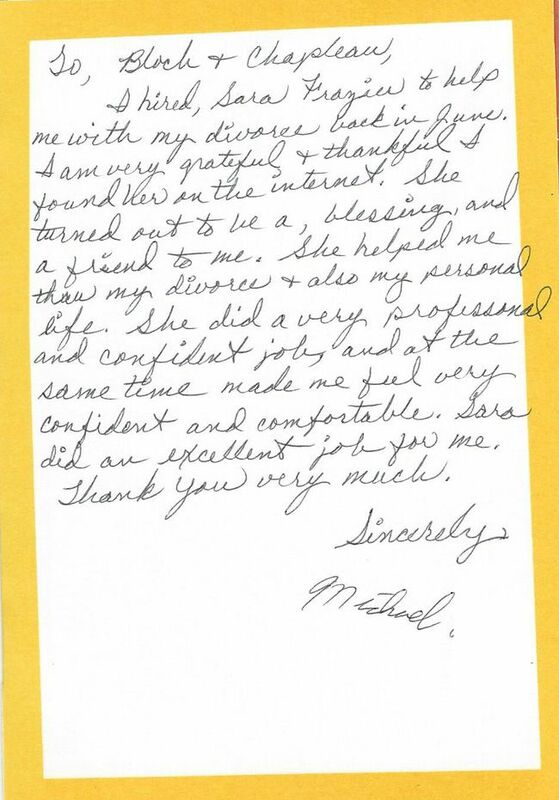 Good over came and Sara’s knowledge of our legal system made the difference! Thank you Sara for making a positive difference in my life and for being absolutely incredible at what you do! 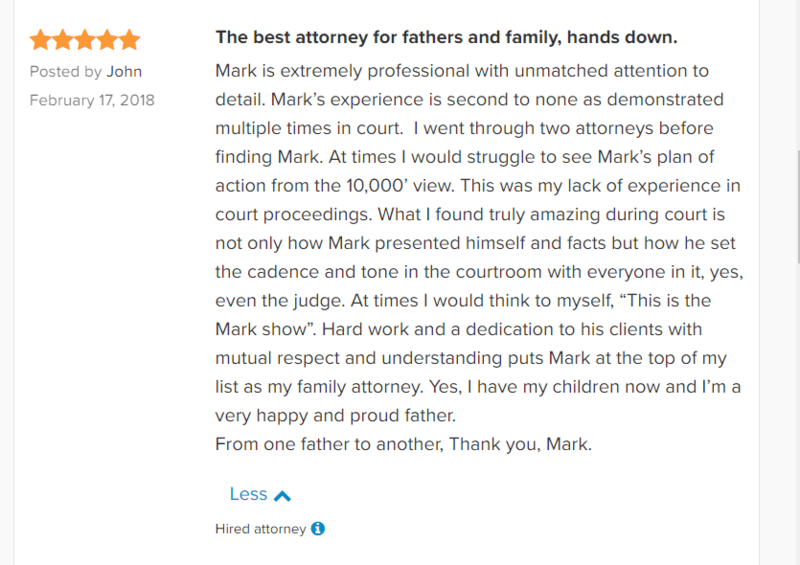 Mark is an amazing attorney who helped me through a very difficult situation with my ex-husband, who had hired an extremely aggressive attorney in response to my request to make minor modifications to our previous case, and an increase to child support. I was extremely happy with the results in my case! 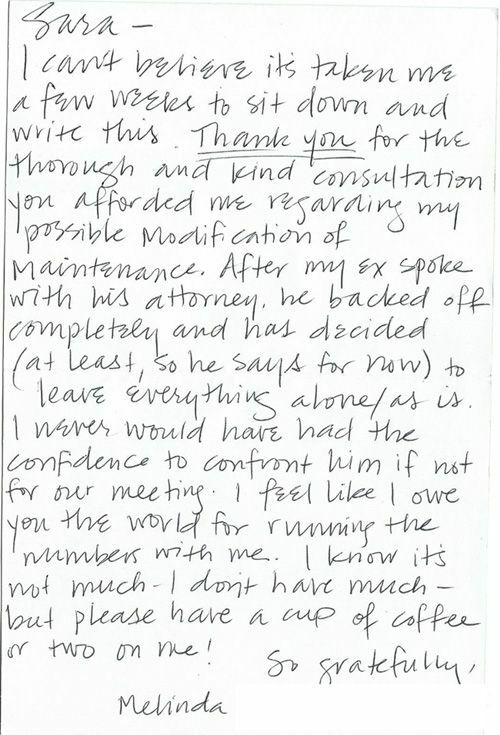 He was also able to clear up many problamatic issues from previous orders with my ex-husband, and combined everything into one clear order, which I had been desiring for years. Throughout the entire process Mark was extremely professional, diligent, paid great attention to detail, and was always quick to respond to any questions I had. I think Mark is an excellent attorney and I would definitely recommend him and will be hiring him again in the future should I need to!! Mark is extremely professional with unmatched attention to detail. 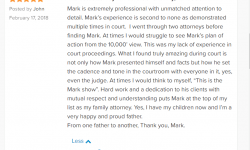 Mark’s experience is second to none as demonstrated multiple times in court. I went through two attorneys before finding Mark. At times I would struggle to see Mark’s plan of action from the 10,000’ view. This was my lack of experience in court proceedings. What I found truly amazing during court is not only how Mark presented himself and facts but how he set the cadence and tone in the courtroom with everyone in it, yes, even the judge. At times I would think to myself, “This is the Mark show”. Hard work and a dedication to his clients with mutual respect and understanding puts Mark at the top of my list as my family attorney. Yes, I have my children now and I’m a very happy and proud father. From one father to another, Thank you, Mark. In working with Mark Chapleau for 10 years with my complex and ongoing custody needs for my son I found Mark to be conscientious and of the highest personal and professional integrity. His demeanor in the courtroom was precise and commanding. What Mark accomplished in my particular case was nothing short of miraculous. Mark heard and understood what my son’s needs were and helped the Colorado Court work for my son so he was not lost. I genuinely believe that my son’s life would not be as safe and rewarding as it is today without Mark’s diligent work and consistent council. Mark gave me a safe harbor to explain my situation and not only represent me and my son in the best possible way but also did not hesitate to tell me when I was wrong. He routinely broadened my understanding of the system and gave me clarity about what the law could do to protect my son. Mark – I wanted to touch base with you and thank you again for a great performance and outcome for my temporary orders hearing. It has taken much stress off my plate. I am planning on returning to work on Monday and wanted to ask you advice about a caregiver for Jaxon and Chloe for the rest of the sumer. Would it be negative if I were to ask Adillae? She is headed to college as you know and could use some spending money. Like killing two birds with one stone. My only concern is that Jera could use it against me? 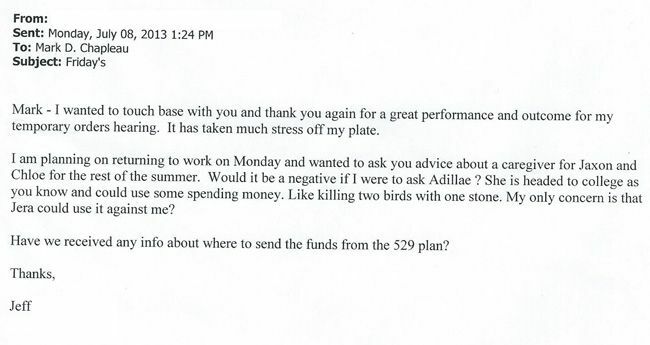 Have we received any info about where to send the funds from the 529 plan? Sorry this took me so long to get to your. 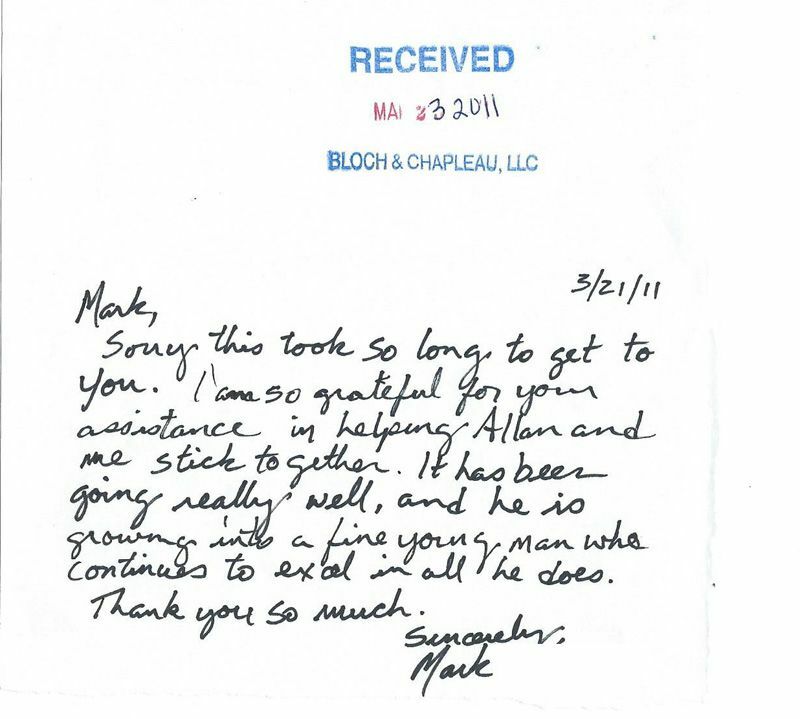 I am so grateful for your assistance in helping Allan and me stick together. It has been going really well, and he is growing into a fine young man who continues to excel in all he does. 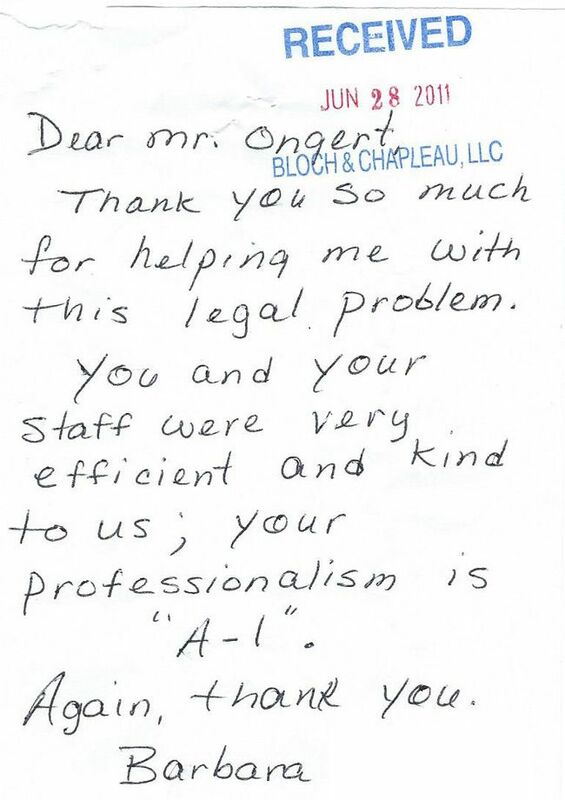 After battling with my ex over our son for years, and not getting even the courts to listen I hired Mr. Chapleau and his firm. They spent the first month catching up; as to be expected, but made a hard push for the holidays. 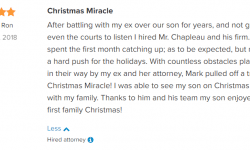 With countless obstacles placed in their way by my ex and her attorney, Mark pulled off a true Christmas Miracle! I was able to see my son on Christmas Eve with my family. Thanks to him and his team my son enjoyed his first family Christmas! Sara is a bright, competent, and professional attorney. She exemplifies the very best of what it means to be an advocate. 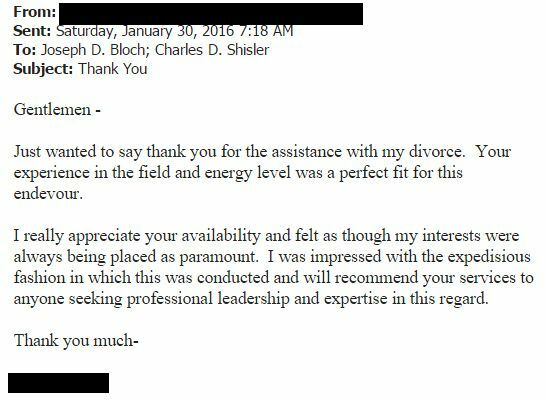 I hired her a year ago to represent me for my divorce, after I had an unpleasant experience with another law firm. From day one, I knew Sara was the right choice. Sara’s demeanor is very businesslike, professional, and to the point. There’s not a lot of idle chit-chat. She talks fast, works quickly/efficiently, and gives you lots of bang for your legal buck. Bills are always fair, thoroughly-described, and easy to understand. Sara consistently demonstrates the ability to hold a large set of complex facts in mind at once, and always finds the right arguments and tactics to pursue my goals. 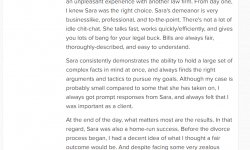 Although my case is probably small compared to some that she has taken on, I always got prompt responses from Sara, and always felt that I was important as a client. At the end of the day, what matters most are the results. In that regard, Sara was also a home-run success. Before the divorce process began, I had a decent idea of what I thought a fair outcome would be. And despite facing some very zealous opposition, Sara helped us to reach that fair outcome almost exactly. I got 50% custody of my daughter, a fair division of assets, and have been able to move on with my life. Divorce is ugly, difficult, and painful, but I am extraordinarily grateful to have had Sara on my side. THANK YOU SARA! Sara and her firm took the time to guide me through the proceedings and were willing to listen to my needs and make this as painless as possible. I was charged for only the services rendered and the billings generated were clear and concise. The charges were fair and I felt that I got benefit for every hour charged. My case was not contentious and Sara did not try to make more of it than what it was. Just wanted to say thank you for the assistance with my divorce. Your experience in the field and energy level was a perfect fit for this endevour. I really appreciate your availability and felt as though my interests were always being placed as paramount. I was impressed with the expedisious fashion in which this was conducted and I will recommend your services to anyone seeking professional leadership and expertise in this regard. 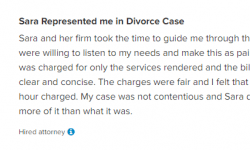 Joe and His team provide excellent representation during my divorce. He was always available, in tune with my needs and desired pace. Charlie – Joe’s Paralegal – was responsive, experienced and diligent with deadlines. I sincerely appreciate their expedisious approach and willing to approach the case in a budget minded and professional fashion. I hired Sara for my divorce in May 2016. 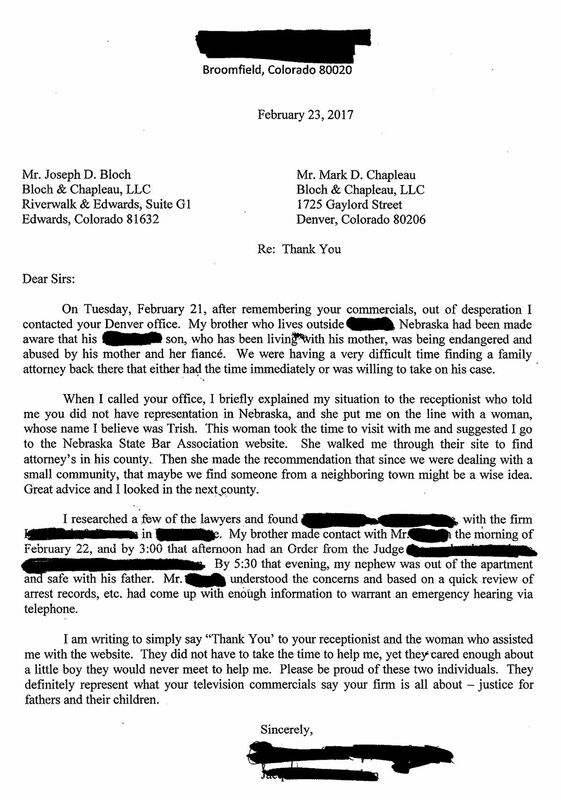 She had been recommended by another attorney that had had a family emergency to handle and could not take my case. From the beginning Sara was professional. Between her and her assistant Heather I felt I was always kept informed as to the next steps in the process. If I had questions they would get back to me within 24 hours. Sara was straight forward with her advice even when I did not agree and I wanted to go in a different direction. She would explain in detail why her course of action would be the smart way to go. Not once during the process did I feel that she was leading me down the wrong path. She never made me feel that the divorce was about her getting paid but rather about me getting a fair settlement. I will have no problem recommending her as a fair, honest and relentless attorney. I am grateful she and her staff were able to represent me. 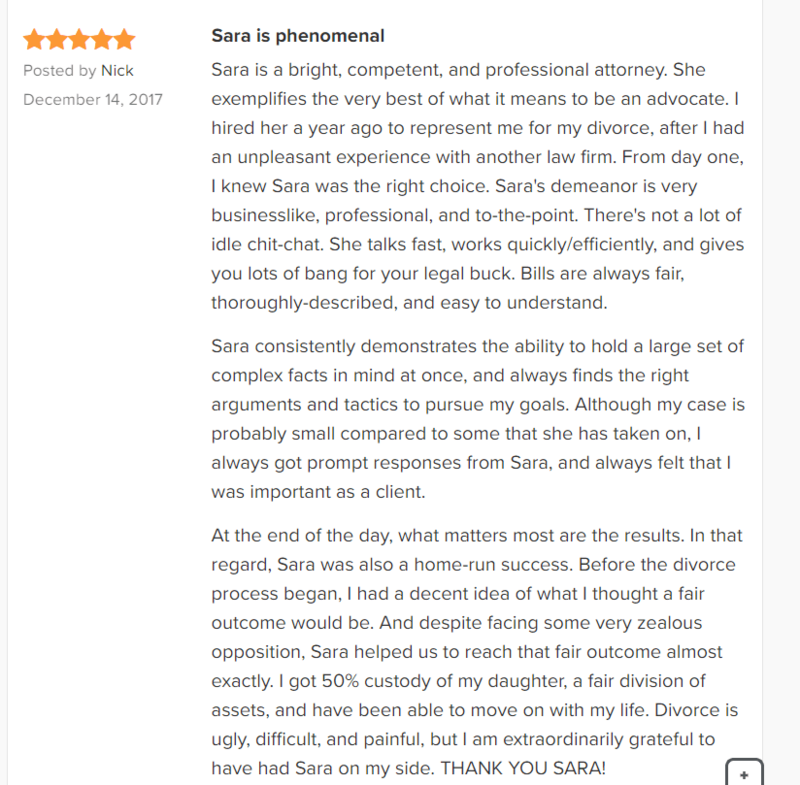 I would recommend Sara Cates because she is Honest, Knowledgeable and Experienced in Divorce Law. Her team and partners give her depth in her practice. I felt my property and finances were in excellent hands. Thank you very much. Sara did a great job! My case was not an easy one and she kept me informed and made sure I knew what the next steps were. I have already recomended a few people to her. Thank you Sara! On Tuesday, February 21, after remembering your commercials, out of desperation I contacted your Denver office. My brother who lives outside [redacted], Nebraska had been made aware that his [redacted] son, who has been living with his mother, was being endangered and abused by his mother and her fiance. We were having a very difficult time finding a family attorney back there that either had the time immediately or was willing to take on his case. When I called your office, I briefly explained my situation to the receptionist who told me you did not have representation in Nebraska, and she put me on the line with a woman whose name I believe was Trish. This woman took the time to visit with me and suggested I go to the Nebraska State Bar Association website. She walked me through their site to find attorney’s in his county. Then she made the recommendation that since we were dealing with a small community, that maybe we find someone from a neighboring town might be a wise idea. Great advice and I looked in the next county. I researched a few of the lawyers and found [redacted] with the firm [redacted] in [redacted]. My brother made contact with Mr. [redacted] the morning of February 22, and by 3:00 that afternoon had an Order from the Judge [redacted]. By 5:30 that evening, my nephew was out of the apartment and safe with his father. Mr. [redacted] understood the concerns and based on a quick review of arrest records, etc. had come up with enough information to warrant an emergency hearing via telephone. I am writing to simply say “Thank You” to your receptionist and the woman who assisted me with the website. They did not have to take the time to help me, yet they cared enough about a little boy they would never meet to help me. Please be proud of these two individuals. They definitely represent what your television commercials say your firm is all about – justice for fathers and children. I can’t believe it’s taken me a few weeks to sit down and write this. Thank you for the thorough and kind consultation you afforded me regarding my possible modification of maintenance. After my ex spoke with his attorney, he backed off completely and has decided (at least, so he says for now) to leave everything along/as is. I never would have had the confidence to confront him if not for our meeting. I feel like I owe you the world for running the numbers with me. I know it’s not much – I don’t have much – but please have a cup of coffee or two on me! 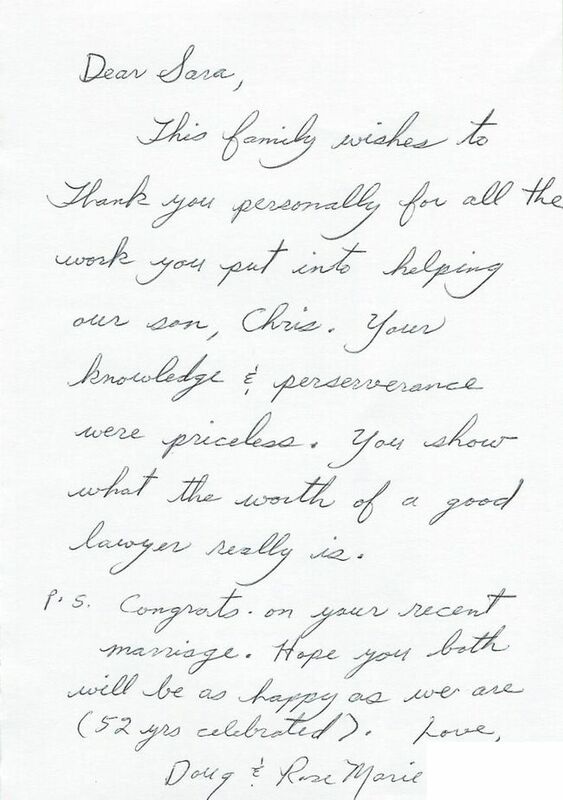 This family wishes to thank you personally for all the work you put into helping our son, Chris. Your knowledge & perseverance were priceless. You show what the worth of a good lawyer really is. P.S. Congrats on your recent marriage. Hope you both will be as happy as we are (52 yrs celebrated). I hired, Sara to help me with my divorce back in June. I am very grateful + thankful I found her on the internet. She turned out to be a, blessing, and a friend to me. She helped me through my divorce + also my personal life. She did a very professional and confident job, and at the same time made me feel very confident and comfortable. Sara did an excellent job for me. Thank you for the update on where things stand. I really appreciate all that you did in helping me through my case! 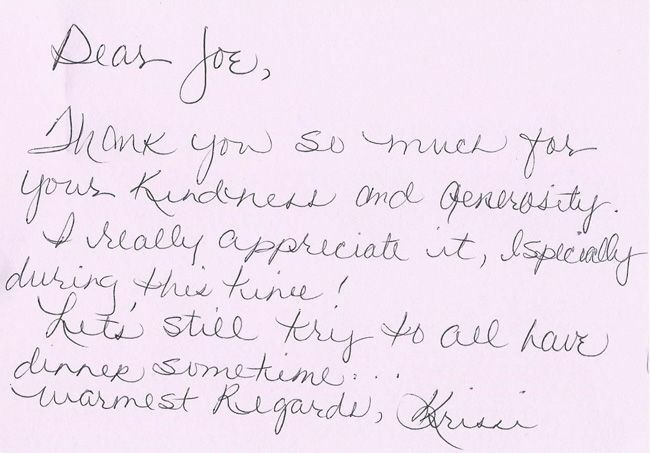 Joe has a great team of people and it made the experience much easier. Thanks again and I wish you the best for you and your family!